Anthropologie is finally throwing us a little bone. Get your Anthro card out and get 30% off ornaments now through December 8th. Although I was hoping for a similar discount off clothes, it's a start, people. Coincidently, now that there's an actual sale happening the Anthro site is not functioning due to maintenance (another first in my memory). Oh, joy! I would not have not about the ornament sale if I had not seen your post! Now, that anthro card can finally come in handy! yay! I can finally get a new ornament for my tree and it will give me a good reason to back into Anthropologie. Ask to sign up for Anthro card at the store counter. 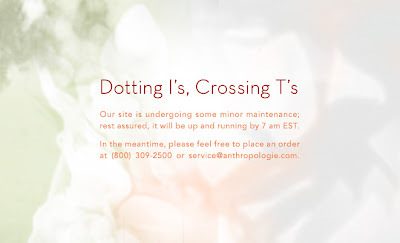 I'm not sure if you can sign up on-line and I can't double check since Anthropologie website is still down.